When Braden was young, and it became clear to us just how severe his needs were, Mike and I came to a conclusion and understanding that Braden would be living with us for the rest of our lives. We accepted this as truth, but also made it our goal to work with him so he could be as independent as possible. Following through with this wasn’t as easy as you would think. For instance, Braden would come to us with a bottle, and we would find ourselves opening it for him without thinking. It was our daughter who consistently reminded us that he should be doing those things for himself. Without Madison’s polite nudging, we may have given in to taking the easy route when Braden needed help. I love how both of our children became the best teachers Mike and I have ever had. This summer we noticed a change in Braden. He seemed to want to help out around the house. Now this is amazing for any teenager, right? Braden started following us around uttering the familiar, “Yeah.” When Braden says, “Yeah,” it means he wants something. Usually, once we can get him to communicate, either verbally or with an iPad communication system, he requests food, swimming, or riding in the kayak. But this wasn’t always the case this summer. What we realized, but he had no way of communicating it, was that he wanted to help us do our housework. So this summer, Braden had two main chores; emptying the dishwasher and hanging the clean clothes. Both took a while to teach him. Dishes were often stacked in ways that would make the most skilled Jenga player squeamish, but he did it, and he liked doing it. When hanging clothes, they were often hung in precarious ways, but he did it, and he liked doing it. He even started doing a few more things around the house such as loading the wet clothes into the dryer, making his own breakfast (toast or Eggo waffles) and unloading the groceries from the car. About three years ago, some friends of ours, Max and Uang had an idea; to create a vocational training center for young adults with needs. Uang, an incredibly talented baker, already ran several bakeries specializing in allergen free (gluten free/ dairy free) delights. Max is a special educator and sibling of an adult with autism. Together, this wonderful couple created STEPS with Theera, and thanks to them, they have changed the lives of so many young adults who certainly had no working options in Bangkok beforehand. Not only does STEPS train students to work in their restaurant, they also train them to generalize their working skills into the community. Thailand has a law that 1 in every 100 employees must be a Person With a Disability (PWD). If businesses choose not to abide by the law, they are fined. Most take the fine as they do not know how to work with PWD’s, So STEPS is working with companies to educate them. There are several groups who are now willing to hire STEPS trainees, and these young adults are now paid employees! When STEPS opened two years ago, Max let us know that while she would love to have Braden, the program was still too new, and they weren’t ready to take someone with Braden’s level of need. We understood. During the first few years of any new business, you need the conditions to be ideal to ensure success. Braden, with his unpredictable behaviors and inability to express himself, would have been too difficult during the beginning stages. This summer, I wrote to Max and told her how hard Braden was working. I asked her if she knew of anyone we could hire who could be Braden’s “job-coach” and to gather some ideas of where he could work in the community. Max gave me a few ideas and Mike and I started researching ways to get Braden working rather than attending school full time. He is 19 after all. The hunt proved to be difficult. Although there were some contacts in the area of business owners, they didn’t know how Braden could work there if he couldn’t speak or understand Thai. Then there was the issue of businesses not understanding how to work with someone like Braden. So, our search stalled and Braden continued in school as normal. In September, Max wrote to tell me that they thought they were ready for Braden and that he could start at the end of October. I’m not sure anyone could ever understand what I felt in that moment unless they’ve been there themselves. This boy, who cannot express himself, who breaks toilet seats, who tears apart his shoes, and who didn’t sleep for years, was finally being given an opportunity…an opportunity to contribute to society in a meaningful way…which is all we, as parents of children with special needs, really want for our kids. It’s also something Mike and I wondered if it could ever be possible. In the morning I introduced Braden to STEPS, the team, and places, and then started office work. We did 2 different tasks, 1 with typing to assess his awareness of alphabet, and 1 with numbers using a notebook and calculator. He and enjoyed the activity and put effort in too. During that time we practiced life skills like bathroom, mopping the floor and trying to find activities for him and find out that he very loves to sat on bean bag! We have a break during 10.15 and let him have his snack (corn flakes) he finished his bag of corn flake. I asked him checked himself after the meal to make sure he clean his self(face,clothes). After that we went to the shop and ordered for lunch. Today I opened the menu for him and let him choose the meal and he choose spaghetti and then we continued office work (fold paper into 2 side) he was focused on his work (and only some bean bag break). I laughed so hard after reading this. They were trying to see what Braden liked doing, and it seemed what he liked best was sitting in a bean bag! He is first and foremost a teenager. Since his first day, Braden has gotten to clean the restaurant before it opens, make banana pancakes for his classmates, laminate materials, and other small tasks such as these. 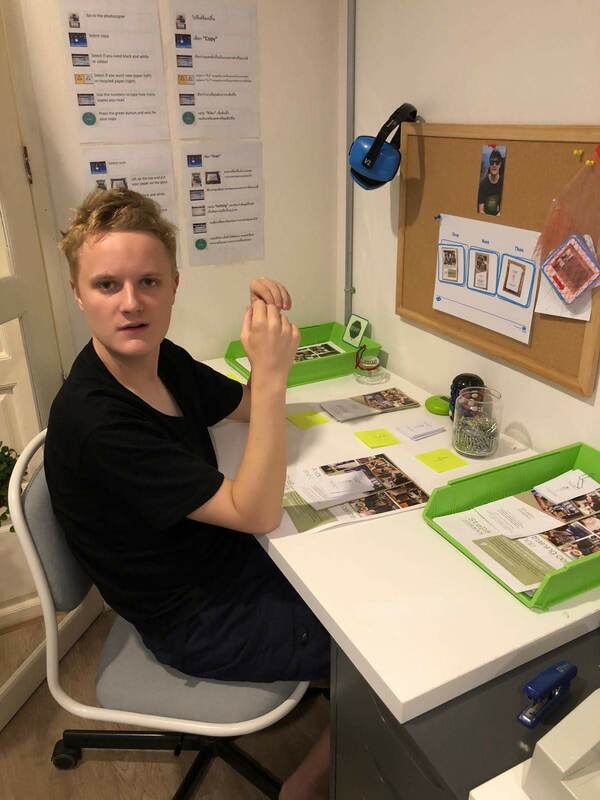 He works 2 ½ days per week and attends school at Bangkok International Lifeskills Center-BILC (another wonderfully supportive environment) the other 2 ½ days. Mike and I have noticed a change in Braden. We can tell that he feels good about himself and what he has accomplished each day. He smiles when we ask him about STEPS. We smile because he is smiling. Braden may still live with us for the rest of our lives. But for the first time ever, we feel he has opportunity…and he feels he has purpose. He’s a proud working man. And we are his proud parents. Yes, they certainly have made dreams come true. So happy to hear Nikita is doing well! I’m excited for Steps with Nakita in Phuket as well. We Were Empty Nesters…For 2 Nights.